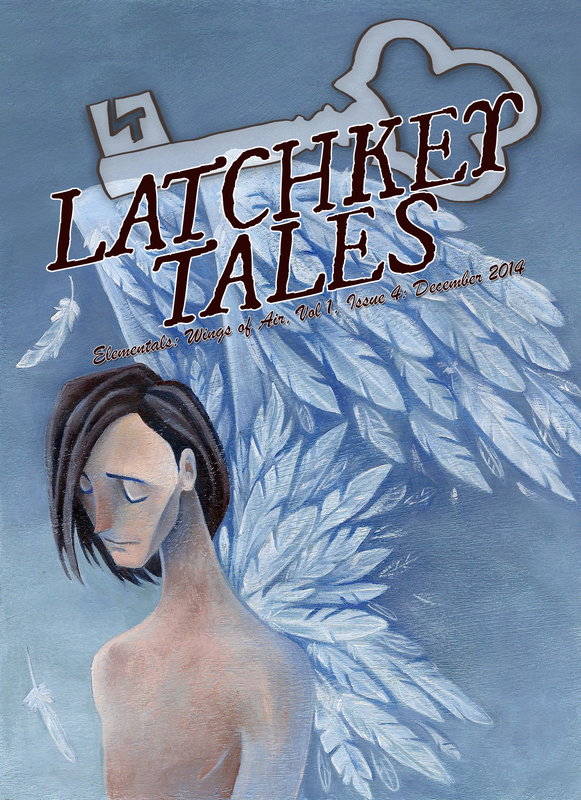 I can now reveal the Table of Contents for the next edition of Latchkey Tales: Wings of Air! This is the last one for the year, and, if I say so myself, I think it’s our best yet. I’ve been proud of all of them, but this one has that magical anthology alchemy you get sometimes. I’m super excited about it. So! Without further ado, the ToC is below, along with the updated cover with the names of our awesome writers. Submissions for this year’s last edition of Latchkey Tales, “Wings of Air” closed over the weekend, so I will be starting to work through them and put it together over the next couple of weeks. Remember, the best way to get your hands on Latchkey Tales is to subscribe at our Patreon page, where you can get an electronic version of each edition for one tiny dollar every two months. As soon as I have finished putting “Wings of Air” together, I’ll be starting work on the Omnibus 2014 book. I haven’t yet decided if I will be running a crowdfunding campaign for this, but if I do, it will be a relatively small, low key one, probably just to cover the costs of the cover art, and to top up payments for all the amazing writers and artists who have helped me make this project a possibility over the last eight months. It really has been a labour of love, I thoroughly enjoy being able to bring these stories and poems to you every two months, and i couldn’t do it without their astonishing work. The Omnibus edition should be available on Amazon in time for it to be a perfect Christmas present for that short story junkie in your life. Submissions for the first two editions are already open, so if you have stories or poems that fit those themes, please feel free to start submitting. I will also soon be actively seeking artists for these covers, so if you’re an artist interested in working on one of these covers, please email me at solarwyrm@gmail.com and let me know which one interests you. 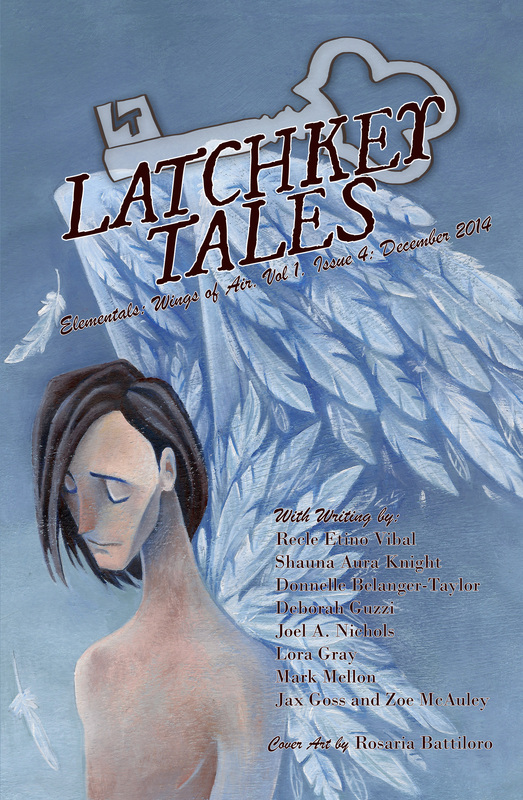 This is the beautiful cover for December’s edition of Latchkey Tales (Wings of Air). It is designed by the talented Rosaria Battiloro, and is the last in our Elementals cycle. NOTE: Submissions for this edition close on the 31st October, which is this Friday! I’m a little low on submissions this month, so if you have a story or poem that needs a home that fits the “WINGS OF AIR” theme, please submit it NOW! I’ve just finished putting together the third edition of Latchkey Tales – Songs of the Earth, and it’s another awesome edition. It includes stories by Zoe McAuley, Hall Jameson, Jax Goss, Tanya Bryan and Carol Holland March, and poems by Shauna Aura Knight, Roscoe Matthews and Deborah Guzzi. The table of contents is below, but before we get to that, I’d like to draw your attention to our Patreon page, where there is an awesome promotion going on, which will be the last of its kind before the 2014 omnibus comes out in early 2015. For September only, you can get all three of the existing Latchkey Tales (including “Songs of the Earth”, the new one coming out in October) for the price of ONE. If you subscribe to Latchkey Tales in September, when I send you “Songs of the Earth”, I’ll also send “Fire and Ice” and “Children of Water”. So hit the link and subscribe now! While the two previous editions are available on Amazon, until the Omnibus comes out, this is by far the cheapest way to get all these amazing stories. And it’s only on offer during September, so time is running out. Do it, do it NOW! Table of Contents for “Songs of the Earth”. In other promo news, Allusions of Innocence will be available for download for THREE DAYS only for free starting the 23rd September. I’ll be posting about this again, once the promo is live, but thought I’d give people who have read all the way down to here a heads-up. You can get it for free from the 23rd September HERE. And on a final, more personal note, my Snow Queen retelling, “A Taste of Winter” is going to be included in “Twice Upon a Time”, edited by the ever awesome Joshua Allen Mercier as the firstborn child of his “The Bearded Scribe Press“. I love this story, and what I have seen of the other contributors makes me think this anthology is going to be amazing. Plus the cover was designed by Luke Spooner, who has worked on a number of our projects with us. You can find out more and help with this awesome project here.